What Are the Differences Between Pressed, Cream & Loose Eye Shadow? 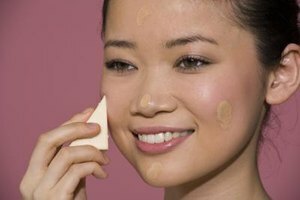 Liquid foundation can be applied in a variety of ways, including with a damp sponge. 2 What Makeup Should I Wear With a Ruddy Complexion? 4 What Are the Differences Between Pressed, Cream & Loose Eye Shadow? Whether you've got a few sun spots, a persistent breakout or just a little redness in your complexion, foundation can help even out your skin tone and make you feel more confident. 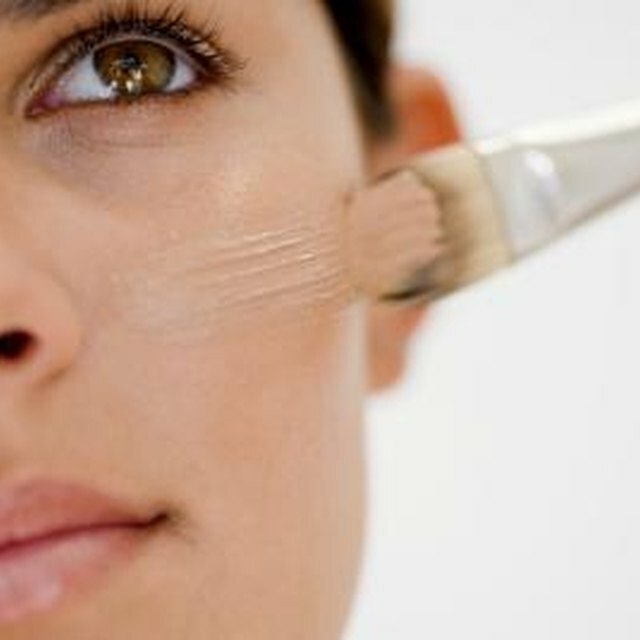 But with so many different types of foundation on the market, choosing the right one may seem like mission impossible. The key is to focus on your skin type and desired coverage so you can achieve the effect that you want for your complexion. Liquid foundation is probably the most common foundation makeup. It has a thin, runny consistency and can be applied with a brush, damp sponge or clean fingers because it spreads and blends easily. All liquid foundations are not created equal, though. Oil-free, matte formulas are best for oily, acne-prone skin and leave the skin with a shine-free finish. Moisturizing, illuminating liquid foundation, on the other hand, is best for normal to dry skin because the formula helps to hydrate and leaves your complexion with a dewy glow. The coverage for liquid foundation can range from light to full, with matte formulas offering the most coverage. Cream foundation usually comes in a solid compact pan, but some formulas are also available in stick form. These foundations tend to be highly emollient and blend easily into the skin, though they apply best with a sponge or foundation brush. While the foundation is extremely creamy when applied, it usually dries to a semi-matte or powdery finish, so you don’t necessarily need to set it with powder. Cream foundation is best suited for individuals with slightly dry, normal or slightly oily skin. It can cling to flaky patches on very dry skin and look greasy on very oily skin, so those skin types should avoid it. The coverage can range from sheer to full depending on the formula and how much is applied. Pressed powder foundation looks just like regular pressed powder and comes in a similar compact. However, it has more coverage and doesn’t wear off as quickly as finishing powder typically does. Pressed powder foundation usually has a smooth, silky consistency and blends easily into the skin with a flat sponge or dense buffing brush. It has light to medium coverage and a matte finish with no shine, so it’s a good match for slightly oily, combination and normal skin. If you have dry skin, it can soak up moisture and make your complexion look even drier. On extremely oily skin, it can combine with the oils and become cakey and thick. Mineral foundation is a good option if you have sensitive skin since it usually contains fewer fillers than other types of foundation. It typically comes in a loose powder form and is buffed into the skin with a brush. Mineral foundations contain ingredients like zinc oxide, mica, titanium dioxide and other minerals and have an extremely natural look on the skin. The coverage usually ranges from light to medium, but you can often apply several layers without it looking cakey to build up the coverage. While some mineral foundations have a matte finish, most have a semi-matte to dewy finish so your skin looks like it has a healthy glow. It can work for most skin types, except those that are extremely oily or extremely dry. Paula’s Choice: Which Foundation Type is Best for You?